Danny “The Shredder” Smith captured his first-ever Space City Open 9-Ball title, plowing through an 83-player field, undefeated, besting Roberto “Superman” Gomez in the first set of the true double elimination final, 9-3. Josh Roberts went undefeated in the 40-player, one pocket division, ousting John Morra in the first set, 3-2, taking home his first Space City Open One Pocket title. 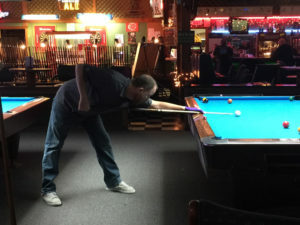 Jeremy “Double J” Jones went undefeated in the 9-ball banks division, taking down Tommy Tokoph in the first set, 3-2, earning himself a whopping fourth, banks division title. Wrapping up four long days of match play, the ladies 9-ball concluded on Sunday, with Gail “Virginia Slim” Eaton defeating Ming “The Empress” Ng, to capture her second, Space City Open title. 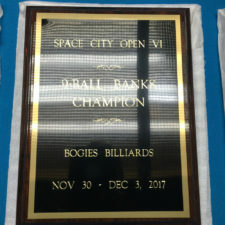 In its sixth year, the four-day, four-division, $6,000 added Space City Open VI (SCO) was held at Bogies Billiards and Sports Bar in Houston, Texas, November 30th – December 3rd, 2017, featuring top players from across America. This year’s line-up featured a cast of new talent, including Danny Smith, Roberto Gomez, John Morra, Jason Brown, and Kelly Isaac, along with numerous others. 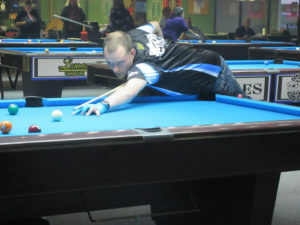 Admission was free, and fans enjoyed four days of top-notch pool, provided by world-class players. In the 9-ball division, Danny Smith obliterated the field with wins over Marlin Griffith, 9-4, J.C. Torres, 9-3, Jeremy Jones, 9-7, and Alex Calderone, 9-4, while Jason “Jaybird” Brown took down Taylor Hobbs, 9-8, Curt Sheldon, Josh Roberts, 9-8, and James Davis, Jr., 9-2. 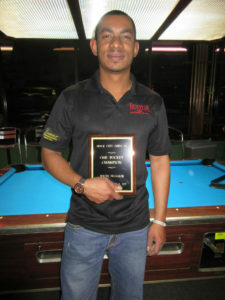 Two-time Space City Open 9-Ball Champion, Charlie “Hillbilly” Bryant, made his way to the final four with victories over Mike Wilson, 9-2, David Twitty, 9-6, Kevin Guimond, 9-0, and Cesar Arechiga, 9-2, while Roberto “Superman” Gomez overcame Kenneth Price, 9-6, Randy Nickerson, 9-3, Chase Rudder, 9-5, and John Morra, 9-2. On the one loss side, Tommy Tokoph took out Roberts, 7-3, and Jones eliminated former pro C.J. Wiley, 7-1, while Yovani Salvia ousted Rudder, 7-4, and Jeff Chauncey destroyed Guimond, 7-1. Back on the east side, Gomez bested Bryant, 9-6, while Smith overwhelmed Brown, 9-4. Smith ran away with the hot seat match, defeating Gomez, 9-2. The one loss side witnessed Morra overpower Tokoph, 7-1, and Jones handily defeat Arechiga, 7-0. Davis, Jr. ended Rudder, 7-6, while Guimond dusted off Calderone, 7-4. Morra went on to eliminate Jones, 7-4, and Brown, 7-1, while Guimond overcame Davis, Jr., 7-3. Bryant squeezed by Guimond, 7-6, rounding out the final four players in the division. Morra was on a role, taking out Bryant, 7-2, to win his fourth match on the one loss side. He was stopped short by Gomez, 7-1, finishing in a respectable, third place. Gomez earned himself a rematch with Smith, and “The Shredder” was ready. With his spot-on break, it was a short-lived set for Gomez, much like the first. 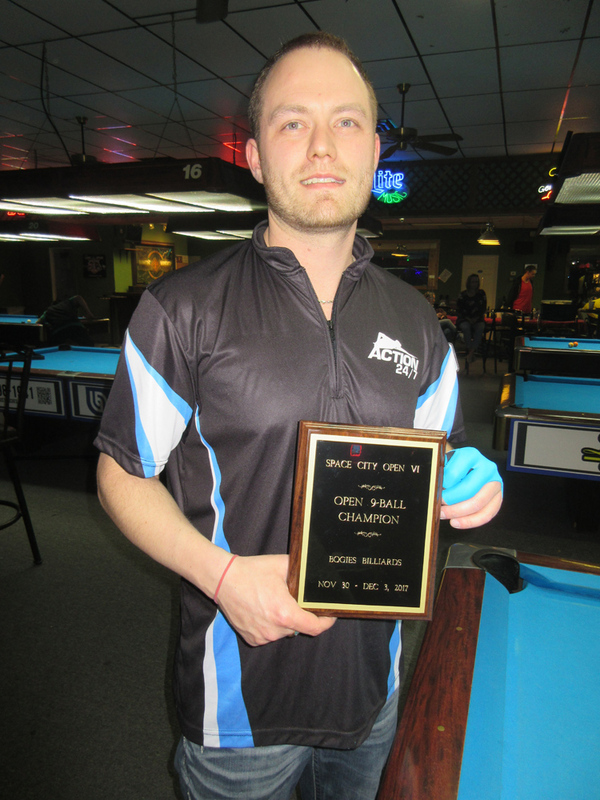 Smith shot out of the gate and never looked back, capturing the first set, 9-3, and his first, Space City Open 9-Ball title. Last year, Josh Roberts finished runner-up in the one pocket division, but this year he came out on top. Roberts ran through a 40-player field, undefeated, booking wins over Jim McCary, Adam Cooper, and Ted Reeves, 3-1, while John Morra overcame Gabe Owen, Marvin Diaz, 3-0, and Sylver Ochoa, 3-1. 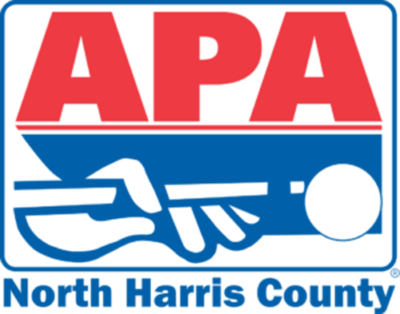 Houston’s Ernesto Bayaua made his way to the final four with wins over Cliff Joyner, Dallas’ Gerardo Perez, 3-0, and Roberto Gomez, 3-1, while Justin Whitehead overwhelmed Curt Sheldon, 3-0, Corey Flud, 3-0, and Kent Berthelot, 3-1. On the one loss side, Davis, Jr. eliminated Ochoa, 3-1, Brown defeated Reeves, 3-0, and Diaz ended Berthelot, 3-1. Following an early hit at the hands of Roberts, Jeremy Jones won four matches, including victories over Jeff Bramblet, 3-0, Jeff Chauncey, 3-1, and Gomez, 3-1. As the final eight took shape, winners’ side matches witnessed Roberts edge out Morra, 3-2, and Whitehead dust off Bayaua, 3-1. Roberts wasted little time with Whitehead, capturing the hot seat, 3-0. Back on the west side, Brown denied Ochoa, 3-0, and Bayaua, 3-2, while Jones squeezed by Diaz, 3-2, falling in turn to Morra, by the same score. Morra made quick work of Whitehead, 3-0, moving on to Roberts, and the finals. In the first set, players were neck and neck. Tied at two a piece, an unforced error by Morra sealed his fate, and Roberts ended the set to secure his first, Space City Open One Pocket title. Kicking off the four-day, billiard extravaganza, was the 26-player, 9-ball banks division, witnessing former Mosconi Cup MVP and former U.S. Open Champion, Jeremy Jones, capture his fourth Space City Open Banks title. Jones blazed a path through Kent Berthelot, 3-0, Gail Eaton, 3-0, and Roberto Gomez, 3-1, while Tommy Tokoph handled Ricki Casper, 3-0, former U.S. Open runner-up, Tan Hoa, 3-2, and Scotty Evans, 3-1. 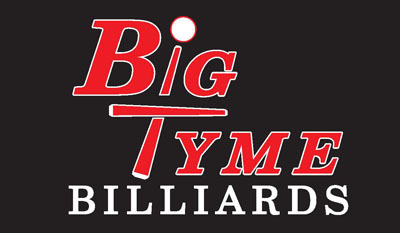 Former U.S. Open Champion, Gabe Owen, checked off Alfred Flores, 3-0, Richie Richeson, 3-0, and Jason “Jaybird” Brown, 3-1, while Cliff Joyner overwhelmed Beaumont’s Carl Honey, 3-0, Will Felder, 3-1, and Alan Myers, 3-1. On the one loss side, John Morra took out Berthelot, while Roberto Gomez ousted James Davis, Jr., 3-1. Canadian Alex Olinger ended Alan Myers, 3-2, while Josh Roberts handled Jason Brown, 3-1. Down to the final eight, on the east side, Jones defeated Tokoph, 3-1, and Owen slid by Joyner, 3-1. In a speedy, hot seat match, Jones crushed Owen, 3-0. Back on the west side, Gomez eliminated Morra, but fell to Joyner, 3-1, while Roberts took out Myers, 3-0, falling to Tokoph in the next round, 3-0. Tokoph was on the war path, sending home Joyner, 3-2, and Owen, 3-2, reaching Jones, and the finals. Players teed off, both keeping pace as the set progressed. Tied at two a piece, Jones inched ahead in the final game, closing out the set to defend his 2016 title and secure his fourth banks title. 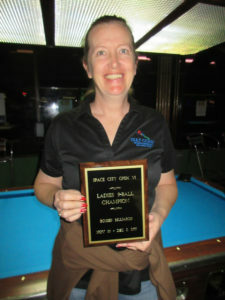 Wrapping up Space City, 24 women battled it out on Sunday for over $2,400 in cash in the ladies 9-ball division. Gail “Virginia Slim” Eaton came out firing, ousting Terry “The Terrorizer” Petrosino, Calaia Jackson, 7-1, and Toledo’s Kelly Isaac, 7-6, while Ming “The Empress” Ng made her way to the final four with wins over Cindy Ferry, Nayla Hoak, and Joyce Davis. Angleton’s Brandi Booth came out firing, securing victories over Ricki Casper, 7-3, and Robyn Petrosino, 7-6, while Teresa “The Princess of Pool” Garland took down Alicia Huff, 7-5, and Yvonne Asher, 7-1. On the west side, Isaac eliminated Denton’s Amy Jones, 5-2, and T. Petrosino reined in Davis, 5-3. Natalie Mans squeezed by Asher, 5-4, and R. Petrosino extinguished Yvonne Ramirez, 5-2. Down to the final eight, east side action saw Isaac eliminate T. Petrosino, 5-3, and Garland, 5-4, while Mans dusted off R. Petrosino, 5-1, in turn, falling to Ng, by the same score. Ng went on to eliminate Isaac, 5-4, and Booth, 5-1, earning herself a rematch with Eaton. In the first set of the true, double elimination final, Ng served Eaton her first loss, 7-6, and the finals ventured into overtime. Players displayed poise and composure in the late hour, but only one player could wear the crown. Players fought for every game, but it was Eaton who pulled ahead to end the second set, 5-3, capturing her second, Space City Open 9-ball title. The Space City Open extends a heartfelt “thank you” to everyone who supported this event; Bogies Billiards and Sports Bar, along with owners David and Shannon Richardson, the entire Bogies’ staff, assistant tournament director, John Newsome, Simplified Electronics, APA of North Harris County, Gulf War Veteran Mike McDonald, Ozone Billiards, and Outsville Billiards. “Special Supporters” of this event included Mark Stubbs, Glen Benton, Ted Reeves, Adam Cooper, Richard Holstein, Richard “Black Diamond” Stuart, and Art Politte. This year’s event featured booths by Jerry Olivier Cues and Cue Repair, Joe Salazar Connoisseur of Custom Cues, Champions Cues, Bryant Billiards, and Q-Xtender.com. Space City Open VII is set for December 6th-9th, 2018. For sponsorship information, please contact Kim Newsome at 713.825.1411, or email lonestartour@gmail.com.